Latest release from "Women In Trucking" group teaches kids about transportation. As president and CEO of the industry group Women In Trucking (WIT), Ellen Voie wears many hats. Last month, she added another chapeau: publisher. 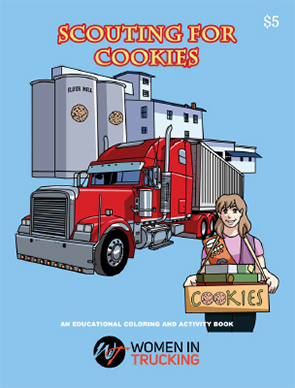 In mid-September, her group announced the publication of "Scouting for Cookies," a supply chain activity book designed to introduce children to the world of trucking. The book aligns with WIT's mission of encouraging the employment of women in the trucking industry and builds on its partnership with the Girl Scouts to raise awareness among youngsters about career opportunities in trucking. But the book has an even closer connection to Voie, since the initial content for the book was created by her niece—Kaylissa Voie—who collaborated on the project with illustrator Erica Hansen and Marvel Comic Book artist Robby Bevard. The 20-page book traces the experience of a young girl named Adelynn, who learns how often a truck is used to move goods throughout the supply chain. Activities in the book include coloring, drawing, word searches, math, and geography. "This activity book was created to give children a way to learn more about how the cookies they eat with their milk started out as grain in a field, became a mixture at a bakery, then moved into the boxes, and were finally delivered by a scout," Ellen Voie said in a statement. "We want them to have a personal connection with that truck on the road and how it relates to their own snack. It's fun and educational and something everyone in supply chain can use to teach children about careers in the transportation industry." The activity book can be purchased through the WIT website. Feedback: What did you think of this article? We'd like to hear from you. DC VELOCITY is committed to accuracy and clarity in the delivery of important and useful logistics and supply chain news and information. If you find anything in DC VELOCITY you feel is inaccurate or warrants further explanation, please ?Subject=Feedback - : Kids' activity book traces cookies through the supply chain">contact Chief Editor David Maloney. All comments are eligible for publication in the letters section of DC VELOCITY magazine. Please include you name and the name of the company or organization your work for.